The Cadence Ensemble was formed in February 2004 by five outstanding Armenian instrumentalists initially to perform the works of Argentine composer Astor Piazzolla (1921-1992). The Ensemble’s premiere concert took place in April 2004, followed by several others that attracted the attention of fans and promoters. The Cadence Ensemble at once became one of the leading and most popular music groups of Armenia. Soon the ensemble expanded its repertoire to include masterpieces of classical and contemporary European, American, Russian and Armenian composers – while maintaining an affinity for Piazzolla. Arrangements of many famous works, including classical, world music and pop are now included in the ensemble’s musical menu. Also included are composed pieces dedicated to the ensemble and its members. Cadence has enjoyed international exposure through live broadcast of its concerts, and the production of several CDs and DVDs. As a result the Cadence Ensemble is invited to perform in Russia, as well as European, Asian, Gulf and Middle East countries. The first international tour of the ensemble took place in April 2005: Cadence performed in the Teatro Colon and Teatro Cervantes, Buenos Aires (Argentina). In July 2005 the ensemble and its soloists gave concerts and master-classes within the frames of the Pazaislis Festival in Kaunas and Vilnius (Lithuania). In December 2005 the ensemble participated in international music festivals in Tehran (Iran) and Tbilisi (Georgia). In May 2006 Cadence gave concerts in Abu Dhabi, Sharjah and Dubai (UAE), and in September 2006 - in the Cairo and Alexandria Opera Houses (Egypt). In 2007 the ensemble gave concerts in Beirut, Byblos (Lebanon), Paris (France), London (UK), Brussels (Belgium), Shenyang and Beijing (China). In 2008 the ensemble performed concerts in Montreal (Canada), Nicosia (Cyprus) and Beirut (Lebanon). In October 2007 the ensemble recorded two CDs at the Abbey Road Studios of the EMI in London. The recording was done by the Richmond Studios (UK). Both CDs produced by Signum Classics (UK) in 2008 have had wide international distribution. The CD “Expressia: Armenian Metamorphoses” received the Luxemburg “Pizzicato” Music Magazine’s Supersonic Award in November 2008. In May-June 2009 the ensemble gave two performances at the Pasadena Civic Auditorium (Los Angeles, USA) and London (UK). In October 2009 it gave a concert at the Parnassus Hall in Athens and took part in the Dimitria Festival, Thessaloniki (Greece). In October 2010 thanks to efforts of Cadence Music Centre and Ministry of Culture of Armenia was established Yerevan International Tango Festival launched with the concert of Cadence Ensemble and outstanding French composer and accordionist Richard Galliano. In 2010 Cadence gave a concert in Riyadh (Saudi Arabia) and closed the “Armenia: Up-Close” Cultural Year in Slovenia with concert at the Ljubljana Philharmonic Hall. 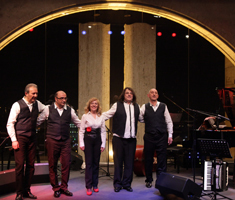 In April 2011 within the frames of Yerevan International Tango Festival the ensemble gave performance with world famous Argentine-Swiss bandoneonist and composer Marcelo Nisinmann. In 2011 the ensemble participated in the “Days of Armenian Culture in Ukraine” with two performances at the Kiev and Odessa Opera Houses. In March 2012 Cadence Ensemble gave a gala-concert at the Strovolos Theatre of Nicosia (Cyprus). In April 2013 the Cadence Ensemble within frames of Yerevan International Tango Festival has performed two concerts in Gyumri and Yerevan with prominent Argentine bandoneonist and composer Walter Rios and singer Mariel Dupetit. Since April 2013 the Argentine-Armenian Tango Project (ARGARM Project) has started its existence. In 2014 the Cadence has participated in celebration of the 300th Anniversary of Sayat Nova in Tbilisi (Georgia) and Cultural Days of Armenia in Israel. On 19th July 2014 within frames of “Stars of the White Nights” Festival the ensemble gave concert at the Mariinsky Theatre. In February 2015 the Cadence Ensemble, Walter Rios, Mariel Dupetit and Pablo Aslan gave a performance at Alex Theatre, Los Angeles, USA. Within frames of the “100 Lives” Project with composer and poet Marine Ales the Cadence in October-November 2015 gave performances at the Mardjanishvili Theatre in Tbilisi, Georgia, and the Hermitage Theatre in St. Petersburg, Russia. Born in Yerevan, Armenia, Hakob took up the guitar at the age of seven, taking his first lessons at the Yerevan Music Salon - School. In 1978-1982 he continued at guitar department of the Romanos Melikian Music College, guitar department, under professor Edouard Badalian. In 1990-1994 he was a student at the Yerevan State Conservatory. From1985 to 1991 Hakob was a soloist of the Armenian State Philharmonic Society. Hakob has worked as a teacher of guitar in music schools and in the Yerevan School of Arts. Since 1995 he is professor at the Yerevan State Conservatory. In 1982 he was named Laureate of the Third All-Union Festival of Guitarists (Dnepropetrovsk, Ukraine), the most prestigious professional guitar festival in the former Soviet Union. Hakob has given concerts and master-classes in Ukraine, Russia, Georgia, Estonia, Belarus, Germany, Syria, Poland, the Czech Republic, Belgium, France, Italy, Lebanon, the USA, Lithuania. His repertoire includes works by Vivaldi, Bach, Paganini, Ponce, Albeniz, Granados, Moreno-Toroba, Rodrigo, Mikrotikos as well as Spanish flamenco, Latin American music, works and arrangements of modern composers. In September 2012 Hakob was granted the honor title of Merited Artist of Armenia. Hakob has 4 CD of his own and participated in numerous recording projects by known artists. Varazdat (Varo) was born in Yerevan, Armenia. After graduating from the Tchaikovski Music School he pursued his higher and post-graduate music education at the Yerevan State Conservatory (1985-1992) under professor Aram Shamshian. While studying at the conservatory he was concertmaster of the Yerevan State Conservatory Orchestra which toured intensively in the former Soviet Union republics. As one of the leading violinists in Armenia Varazdat takes part in numerous concert and recording projects. He has given recitals in Switzerland, Spain, Thailand, Lithuania, Latvia, France, Argentina, Brazil, Uruguay, Russia, Iran, Georgia, Ukraine, Bulgaria and Italy. He is known as one of the best virtuoso performers of Russian and Gypsy romances. Varo is one of the founders of the Cadence Ensemble in 2004. After leaving the ensemble , he performed as soloist in various groups and projects, returning to Cadence in July 2012. In September 2012 Varazdat was awarded with the Movses Khorenatsi medal, in 2015 he got the honor title of Merited Artist of Armenia. He has 2 CD and participated in numerous audio and video recording projects by known Armenian artists. Meruzhan was born in Yerevan, Armenia. many others. He has performed in Russia, Lebanon, Canada, the USA and Cyprus. Meruzhan joined the Cadence Ensemble in 2011. Meruzhan has one CD and has participated in numerous audio and video recording projects of known Armenian artists. Sofi was born in Yerevan, Armenia. She graduated from the Tchaikovsky Specialized Music School in 1988, continuing her education at the Yerevan State Conservatory untill 1993. In 1995 she recieved her post-graduate diploma from the Conservatory. The same year she was named assistant professor at the piano department of the Conservatory. In the period 2000-2010, Sofi was professor of the Conservatory Piano Department. Since 2010 she is concertmaster with the Jazz and Pop Music Department of the conservatory. In 1996-2003, she was the pianist of the Yerevan State Conservatory Piano Quintet. As member of the quintet she participated in the audio recordings of works of the leading Armenian composers Arno Babadjanyan, Edgar Hovhannisyan and Stepan Shakaryan. For close to a year Sofi was piano soloist of the Yerevan State Chamber Orchestra. She has performed with the Yerevan State Radio and TV Orchestra (conductor Ohan Durian), the Jazz and Variety State Orchestra (conductor Yervand Yerznkyan). She gave concerts with the quintet in Dubai, Abu Dhabi (UAE), the “Liberty” Jazz Band in the USA, Caribbean Islands, Mexico and violinist Christina Mikayelyan in Washington (USA). Sofi is one of the best known pianists in Armenia who gets numerous invitation to perform with different jazz and pop bands in Armenia and abroad. She is the pianist of one of the most popular Armenian jazz groups in Armenia “Hay Way”. Sofi has been pianist of the Cadence Ensemble since July 2012. Gurgen was born in Yerevan, Armenia. He graduated from the Tchaikovsky Specialized Music School as a cellist. For many years he was contrabass player for the “Tkzar” Armenian Traditional Music Orchestra. Since 1997, he has been playing bass guitar in the “Re Minor” Band accompanying famous Armenian pop singer Forsh. He took part in the tours by Forsh and his band in Germany, France, Canada, Ukraine and Russia. He has participated in 4 CD and 2 DVD productions of Forsh and the band. Gurgen became member of the Cadence Ensemble in July 2012.